There’s hardly a more iconic place to view the breathtaking Japanese cherry trees (called ‘sakura’) in bloom than the Asakusa district of Tokyo. See brilliant displays of springtime blossoms in their full splendor along the riverbanks of the Sumida River, where you’ll stroll with a local guide in the morning. Cross Azuma-bashi (Azuma Bridge) to the Japanese garden at Ushijima Shrine, one of the most popular spots to see the trees. Conclude at Asakusa Temple on this 2-hour walking tour that is not to be missed! Numbers are limited to 15 people, ensuring an intimate experience with a small group. Please note: This tour is seasonal and runs yearly for approximately one week in March and April. The date is subject to change. Start your cherry blossom tour in Asakusa and follow your friendly local guide on foot across Azuma-bashi, a bridge that was rebuilt in 1931 to replace the original 18th-century construction. Crossing over the Sumida River, you’ll be awed by the rows of Japanese cherry trees (or sakura) that bloom along its banks each spring. Take in the magnificent sight of these breathtaking blossoms awash with delicate pink and white petals. You’ll have photographic views of Tokyo skyscrapers en route to the opposite bank. Continue on until you reach Ushijima Shrine, located in Sumida Park. With more than 1,000 years of history, the shrine’s Japanese garden remains a favorite among the locals for its springtime showcase. 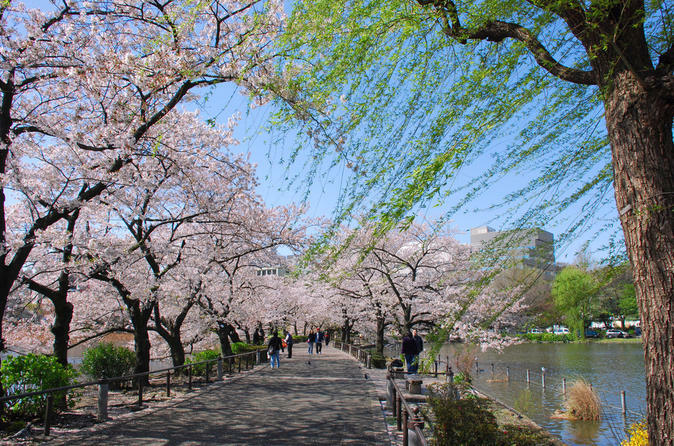 Next, take your small-group stroll along the riverbank where 1,000 sakura burst in a vivid display. In addition to the more typical somei yoshino — think tiny white and pale-pink petals — you’ll find different varieties that bloom with larger flowers and in darker hues of pink. Your last stop is Asakusa Kannon Temple (also known as Senso-ji), one of Tokyo's oldest and most significant temples that receives 30 million visitors a year. After exploring the grounds with your guide, you'll conclude your walking tour at the Asakusa Kannon Temple. From there, you can continue on your own to explore the colorful Tokyo district.